Doctors generally advise against a sedentary lifestyle, and recent findings show that it may be especially dangerous for some consumers. Researchers from the Dalhousie University and University College London say that sedentary time, such as prolonged sitting, can increase the risk of death for middle-aged and older people who also struggle with frailty – defined as having multiple health problems or decreased functional ability. "We found that in people who scored low on the frailty index, sitting time was not linked to risk of death. Prolonged sitting was associated with a higher risk of death only in vulnerable or frail people who did not meet the weekly recommendation for 2.5 hours of moderate physical activity," said lead researcher Dr. Olga Theou. For the purposes of the study, Theou and her colleagues analyzed data on 3,141 adults over the age of 50 who took part in the U.S. National Health and Nutrition Examination Survey (NHANES). 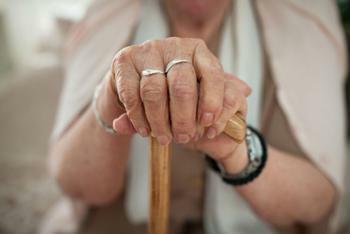 In that survey, participants were asked to use activity trackers to assess their level of frailty, with the results being catalogued into an index. The researchers found that participants who were frailer and had high amounts of sedentary time were at greater risk of death than those who were more active. They say that the results should help doctors focus more on reducing sedentary time to create better patient outcomes. "Physicians should stress the harms of inactivity with patients, similar to the harms of smoking, to encourage movement," said Theou. "Even something as simple as getting up and walking around the house with a walker or cane can benefit frailer people." The full study has been published in the Canadian Medical Association Journal.